Each $138 box contains 8 decks. Each deck contains 40 cards. The fires of Yu-Gi-Oh! 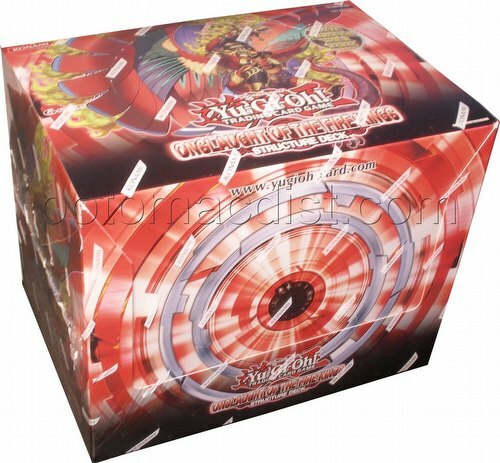 cannot be put out with the arrival of the Onslaught of the Fire Kings Structure Deck, with 4 new Monster cards and 2 extraordinary Spell cards that gives Duelists that extra spark to build a FIRE-themed Deck. Burn your enemies with monsters that rise from the ashes and Fire Kings that activate when destroyed. Special summon Fire King High Avatar Garunix and unleash the sacred fires sealing the victory! Duelists can find additional synergy with cards from Cosmo Blazer! Each deck includes 37 Common Cards, 1 Ultra Rare Card, 2 Super Rare Cards, 1 Rulebook, 1 Game Mat, and a Dueling Guide.